Everyone is innocent until proven guilty even police officers and street lurkers. In this case we have both - but first: let's look at the Branson Daily Independent over the weekend. At the bottom of this story I have printed the journalistic code of ethics.This shows what you can expect from a newspaper - unfortunately we can longer expect this standard from the Branson Daily Independent. China, Iran and other dictatorial regimes require newspapers to print stories without telling the public who produced them (they tell the press what to say and pretend it's researched ). Government entities are a huge asset and resource for journalists. Press Releases can be helpful; but when press releases fill the newspaper unmarked, the public endures harm. It's dishonest to the core and disrespectful to the community. The public thinks they're reading a newspaper but really it's only what the government wants you to know - and tells the newspaper to print. The public has a right to know when a story is written from research, true reporting , and one is published from - fact finding - a public resource that serves as custodians of fact. The majority of the Branson Daily Independent editions now contain unlabeled press releases a cover story and a show review. It also happens to be the most widely distributed newspaper in Branson. Today the Branson Daily Independent proved themselves a poor custodian of fact by printing information they did not verify. The BDI has been doing this for years. And while it's helped them reduce their staff by 75% (When the government writes stories for you; you don't have to pay employees). The story has no author and no byline making the public believe the newspaper created the story. Page three has a story from Gary Groman written five years ago and one that has been printed 9 times (sometimes they just need copy to fill the space). Page seven is where the ethical dilemma begins. If you pick up Sunday's and turn to page 7 you'll see this story published here last week about the Branson Airport below. It's the exact same story - verbatim. But there is a big difference, while the linked story tells you that you're reading a press release - the newspaper story would make you believe a writer at the paper researched the story. Not only is this dishonest, it's a violation of the code of ethics. Moreso, the hundreds of falsely labeled releases last year help corrupt politicians. The paper has produced hundreds of articles written by politicians and have distributed these to the public giving them the false impression they come from a disinterested source. Allowing politicians newspaper print without attribution works against democracy and the goal of the press which is to , "give us the information we need to be free and self governed." You'll notice both articles have the exact same verbiage - word for word the newspaper printed the press release. Here's the difference, Branson Police Chief Kent Crutcher prints his name. The Branson Independent makes it look like the newspaper authored it. This is precisely how newspapers help corrupt politicians get re-elected. 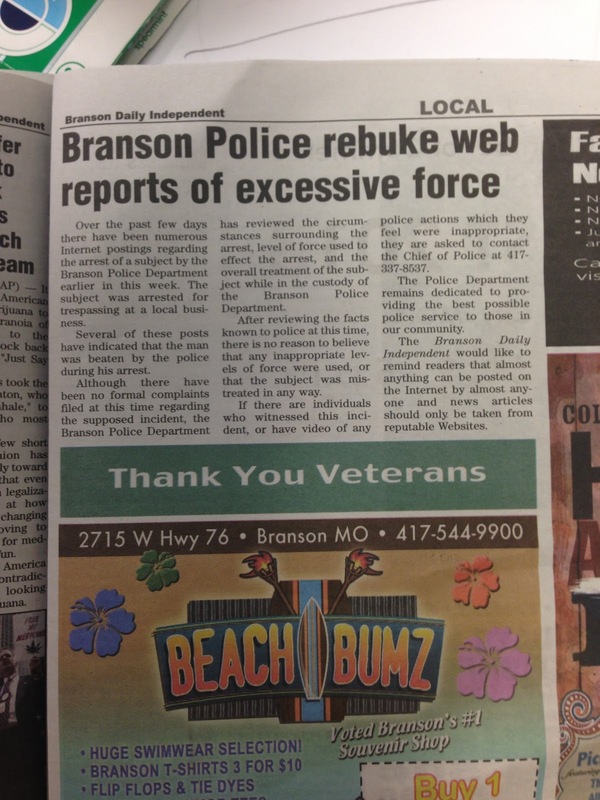 The city of Branson is openly proclaiming that no brutality occurred. There is nothing wrong with that. Crutcher is a citizen and has the right to state his opinion.He's also an employee and has the right to spend tax funds. Labeling the opinion with his name and contact info is an honest means of distributing information. 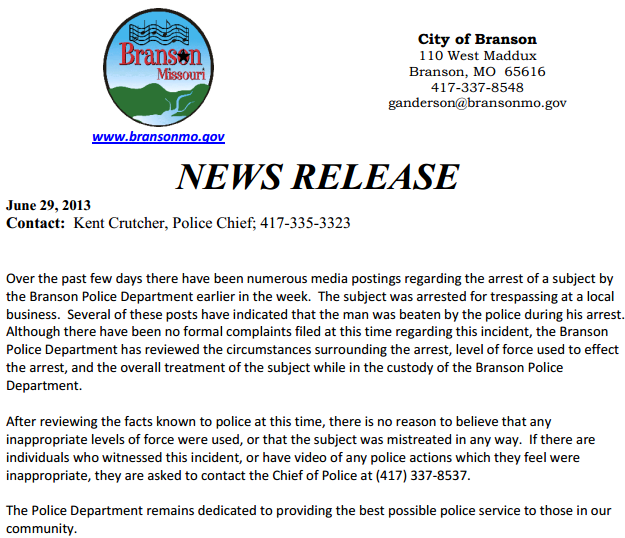 The Branson Daily Independent however, re-published the press release without identifying the entire story is written by the police chief. The newspaper did no research, no fact finding and no journalistic method. 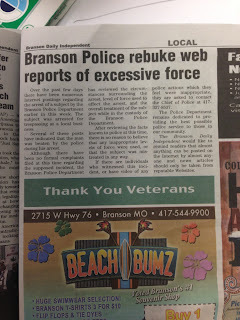 While reprinting the official story from the Branson Police Department without adding or checking any facts they disrespect those who fought for our right to have a free press. Underneath the atrocity the newspaper prints - thanks Veterans. Outlandish Opinion: Perhaps next time they should burn a flag instead - it might be less offensive to an educated public. The Branson Daily Independent broke the code of ethics no less than 15 times in one edition of the newspaper. Failure to adhere to the code of ethics amplifies the reason media outlets are losing trust with the public. Be careful what you read, it might be this Sunday's Branson Daily Independent - A newspaper which doesn't disclose nor chooses to be independent from the politicians who run ads in their paper. Remember, anyone can print a newspaper - only trust outlets who follow the journalistic code of ethics. Ask the newspaper to disclose the sources of their stories - ask them to return to ethical reporting. On June 26th, 2013 a phone call was made to the Branson Police Department by the manager of Country Mart on 248 in order to have a homeless man removed from the premises. The Country Mart employee proceeded to press trespassing charges against a man known by locals as "Tex". Tex, whose real name is Justin Dayle Squyres, was confronted by the police officer and as the situation developed was forcefully taken into custody. Onlookers voiced concern about the incident and the Branson officer's treatment of Squyers. One observer recorded the event on video and immediately brought the footage to a detective at Branson City Hall. The video footage was logged and preserved by a Branson Police Department detective and is in the process of being submitted as part of a package for the Taney County Prosecutor's office as potential evidence for the prosecution. The Taney County Prosecutor, Jeff Merrill will determine whether or not the state proceeds with the case. While prosecutorial discretion is theoretically a determining factor , cases are generally rubber stamped for judicial review. Branson PD suggests Squyres should be charged with. ***Jeff Merrill has officially filed charges as prescribed by Branson PD. Due to the nature of charges suggested by the Branson Police Department, the initial venue will be the 38th District Taney County. The defense has signaled they will ask for a change of venue which will likely by set in Christian County, the northern boundary of Missouri's 38th Circuit Court. Missouri law allows a change of venue or a change of judge at defense request. Squyers was briefly detained by the Branson Police Department before a prominent businessman, Pat Joyce paid his bail and arranged for temporary lodging. During a conversation following the event Joyce lauded developer Rick Huffman for joining him in making substantial contributions to assisting the homeless. Joyce and Huffman believe taking care of the needy is a Christian imperative. They have invested tens of thousands of dollars to the cause without public mention. Compounding public outrage is the understanding Squyers has been diagnosed with Autism. Financial support for treatment and elimination of Autism ranks high with the Branson community and has put a group of citizens on the defensive. A change in leadership at Branson City Hall has greatly changed the dynamic of information flow to the press. Several years ago, Branson Mayor Raeanne Presley entered into the media industry. A sitting State Senator doubled as legal counsel taking payment to help Presley enter an agreement with Shurz communications. Shurz owns two of the top Southern Missouri regional media outlets - KY3 and KSPR. Unfortunately, the press liaison to the 38th Circuit, has blocked access to public resources and has worked vigorously to assist Presley in maintaining office by failing to report basic happenings with Branson Public Funds. While city meetings were being published by private companies free of charge prior to Presley taking office a $200,000 taxpayer funded press room has been established. Most outlets publish these unedited and without confirmation. With every report, KY3 and KSPR note: "The City of Branson is Committed to Open and Honest Government". Ironically, these entities fail to disclose the politician pushing the story is actually a business partner. 1— Test the accuracy of information from all sources and exercise care to avoid inadvertent error. Deliberate distortion is never permissible. 2— Diligently seek out subjects of news stories to give them the opportunity to respond to allegations of wrongdoing. 3— Identify sources whenever feasible. The public is entitled to as much information as possible on sources' reliability. 4— Always question sources’ motives before promising anonymity. Clarify conditions attached to any promise made in exchange for information. Keep promises. 5— Make certain that headlines, news teases and promotional material, photos, video, audio, graphics, sound bites and quotations do not misrepresent. They should not oversimplify or highlight incidents out of context. 6— Never distort the content of news photos or video. Image enhancement for technical clarity is always permissible. Label montages and photo illustrations. 7— Avoid misleading re-enactments or staged news events. If re-enactment is necessary to tell a story, label it. 10— Tell the story of the diversity and magnitude of the human experience boldly, even when it is unpopular to do so. 11— Examine their own cultural values and avoid imposing those values on others. 12— Avoid stereotyping by race, gender, age, religion, ethnicity, geography, sexual orientation, disability, physical appearance or social status. 13— Support the open exchange of views, even views they find repugnant. 14— Give voice to the voiceless; official and unofficial sources of information can be equally valid. 15— Distinguish between advocacy and news reporting. Analysis and commentary should be labeled and not misrepresent fact or context. 16— Distinguish news from advertising and shun hybrids that blur the lines between the two. 17— Recognize a special obligation to ensure that the public's business is conducted in the open and that government records are open to inspection. BRANSON, MISSOURI – Frontier Airlines started service from Denver International Airport (DEN) to Branson, Missouri (BKG), the “Live Music Show Capital of the World” in April of 2010. In that first year Frontier Airlines offered nonstop service with a seating capacity of 33,682 seats (April 2010 – December 2010). Since then, Frontier Airlines has consistently grown capacity to its current level (April 2013 – December 2013) of 77,556; representing 130% increase in service in 2013 compared to the airline’s inaugural year. This fall, the airline will offer additional nonstop flights to DEN, compared to last year’s schedule, between September and December. In 2012 (September – December), Frontier operated 27,876 seats to the market. In 2013, this number will grow to 39,468 seats. This represents a 42% increase in the fall schedule over last year. These new flights will operate on 138-seat Airbus 319 aircraft – offering five rows of comfortable STRETCH seating, offering an additional five to seven inches of legroom, and the airline’s SELECT seating product. Frontier’s website, FlyFrontier.com, offers the guaranteed best fares and is the only place STRETCH and SELECT seating is available at the time of booking. If interested in booking travel to any one of Frontier Airlines destinations, please visit www.FlyFrontier.com. You may also contact FlyBranson Travel Services, located in the Branson Airport, where they can assist you with all of your inbound and outbound traveling needs; including airfare, lodging, shows, attractions, golf and more. For more information, visit www.FlyBransonTravel.com. To make reservations or for more information regarding Branson Airport and its services, call toll free 1-888-FLY-BKG1 (1-888-359-2541) or 417-334-8857 or visit www.FlyBranson.com. The Branson Airport currently has five nonstop destinations and one stop connecting service to more than 100 major cities in the United States. Nonstop destinations include: Chicago, Dallas, Houston, and Orlando on Southwest Airlines; and Denver on Frontier Airlines. For a complete list of destinations available at the Branson Airport, visit www.FlyBranson.com. Known for the unique airport experience and unparallel customer service, Branson Airport LLC is the first privately developed and operated commercial service airport in the United States. Branson Airport is currently serviced by Southwest Airlines and Frontier Airlines; allowing passengers the ability to access over 100 destinations all on low cost carriers. Located in the heart of the Ozarks and centrally located in the Midwest, the airport also boasts a state of the art FBO, Branson JetCenter and a full service travel agency, FlyBranson Travel. For more information visit www.FlyBranson.com or call toll free 1-888-FLY-BKG1 (1-888-359-2541). Frontier Airlines is a wholly owned subsidiary of Republic Airways Holdings, Inc. (NASDAQ: RJET), an airline holding company that also owns Chautauqua Airlines, Republic Airlines and Shuttle America. Currently in its 19th year of operations, Frontier offers service to more than 75 destinations in the United States, Mexico, Costa Rica, Jamaica and the Dominican Republic. The airline employs more than 4,000 aviation professionals, operating from its hub at Denver International Airport. For in-depth information on Frontier Airlines and to book tickets, visit FlyFrontier.com. Our nation’s current immigration system is broken. We have not made major changes to our immigration laws since 1986, and we must address this situation before it worsens. The number of foreign-born residents in the United States is at the highest level in U.S. history. In the past 50 years, the number of foreign-born residents of the United States has gone from just under 10 million in 1960 to 40 million in 2010. We must solve the illegal immigration problem by first securing our borders. When our borders are left open, it allows criminals, drug traffickers and potentially even terrorists to enter the country. I support doing what is needed to secure the borders until we have firm control over who enters our nation. 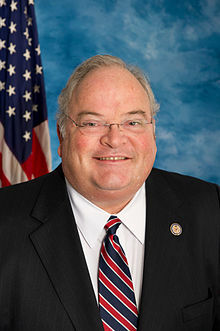 Specifically, I support requiring the Secretary of Homeland Security to certify to Congress that the United States has operational control over its southern border. This has to be the first step in the process of fixing our immigration system. We must authorize and deploy more border security personnel and technology and have border-states work closely together to ensure we are maximizing all of our efforts. I am absolutely against amnesty. We cannot reward bad behavior by granting citizenship to those who broke the law and came here illegally. In 1986 our immigration laws were amended by giving millions of illegal immigrants amnesty in exchange for more secure borders. Unfortunately the amnesty came but our borders were not secured; we cannot make this same mistake again. We must also designate any members of criminal gangs as inadmissible to the United States and deny any chance at citizenship. Additionally, any immigrant with a serious criminal background should be denied entry and any chance at citizenship. Becoming a citizen of the United States of American is a privilege, not a right, and should be taken seriously by those who seek it and those who grant it. We must also require those who came here illegally to go to the “back of the line” behind those who are going through the legal immigration process. Those who have committed fraud, such as using a false social security number, or who have done anything to “get around” the legal system should be denied citizenship. I believe in legal, regulated, and appropriate levels of immigration. America is a nation of immigrants. Our forefathers immigrated to this land in search of freedom from tyranny and oppression, and immigration has remained a prominent feature of American society throughout the history of our nation. America is an attractive nation for immigrants to come build families, conduct scientific research, create businesses, and prosper as members of our vibrant communities. Branson Firefighters responded to a report of a commercial building fire at Coffelt Country Crossroads on Monday evening. Reported initially as a building on fire adjacent to the Acrobats of China Theater parking lot, firefighters discovered a pick-up on fire in the theater parking lot plus three separate buildings on the Coffelt property. mutual aid fire apparatus,” stated Fire Chief Ted Martin. “The firefighters did an excellent job containing all the fires to the area of origin. Due the nature of the older buildings with several additions, firefighters spent several hours checking for fire extension, ventilating the smoke, and assisting the building property owners with salvaging their property and contents,” added Martin. A fourth business on the property reported fire damage to several tables on their snack bar as the fires self-extinguished. Fire investigators from the fire department along with a Missouri State Fire Marshal started the fire investigation process after the fires were extinguished. “Fire investigators worked to eliminate all possible accidental causes and believe the fires to be intentionally set,” stated Martin. The fire department is asking any witnesses who might have seen any suspicious activity at the Coffelt property between 8:45 and 9:00pm to contact the Branson Police Department at (417) 334-3300. Tips leading to the solving of this fire incident may be eligible for a cash reward through the Missouri Advisory Committee on Arson Prevention by calling 1-800-39-ARSON or through their web site at www.MACAP.org. The businesses at the Coffelt property were closed at the time of the fire and there were no reported injuries. It's not your classic Radio Flyer but the more intimidatingly labeled Spyder tri-motorbikes that will be deployed by 6 officers of the Branson Police Department. Branson Police adds CanAm Spyder Motorcycles to fleet Branson will be the first police agency in Missouri to use these motorcycles. The Branson Police Department has taken delivery of two CanAm Spyder motorcycles to add to their fleet of patrol vehicles. Branson PD will be the first police department in the State of Missouri to use these three-wheeled vehicles for police work. Branson Police Chief Kent Crutcher reported that the police department started looking at the option of patrol motorcycles last year, as part of their efforts to offer more community-oriented policing strategies. 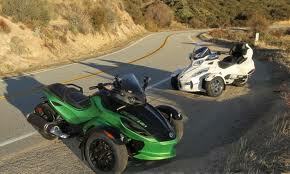 They ultimately decided on the CanAm Spyder vehicles because of several factors. “The CanAm vehicles offer better stability on the hills of Branson, and better safety ratings than traditional two-wheeled motorcycles” Chief Crutcher said. The trikes are fit for off-road terrain increasing the capacity of the department to reach remote areas.